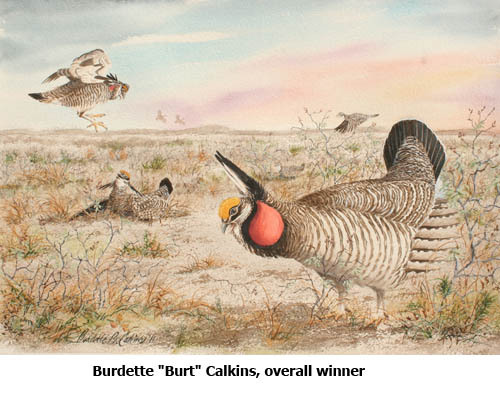 Wildlife artist Burdette “Burt” Calkins’ watercolor painting of booming, fighting and flying prairie chickens was selected as the winner of the 2011 High Plains Lesser Prairie Chicken Festival poster contest. 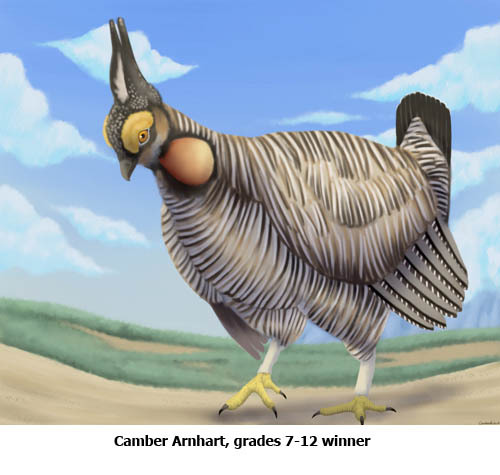 Calkins’ remarkably detailed and accurate depiction of lesser prairie chickens displaying on a mating site, or lek, was among about 25 entries in the adult category. He will receive $300 and his painting will be reproduced as the annual poster for the festival, which will be April 15-17 this year in Milnesand. chicken. 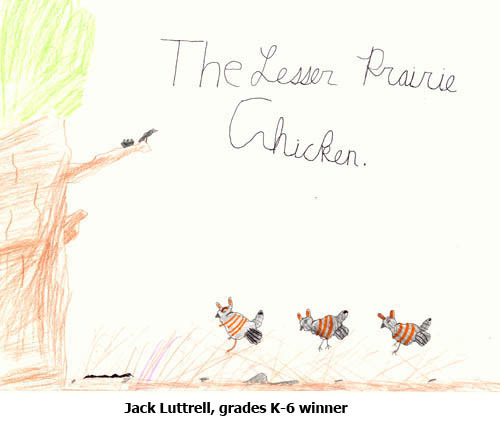 Jack Luttrell, 11, of Albuquerque, won the K-6 category. Both youth winners will receive $50 prizes. birding tours, and enjoy good food and western hospitality. This year’s 10th annual festival is sold out. The festival is limited to 100 participants because of the sensitivity of the lesser prairie chickens during breeding season. Those interested in attending next year’s festival can receive early notification by calling Tish McDaniel, (575) 762-6997 or e-mailing chickenfestival@yahoo.com. EAGLE NEST -- Eagle Nest Lake has been closed to ice fishing because of recent warm weather and winds that caused rapidly deteriorating ice conditions, the Department of Game and Fish and New Mexico State Parks announced Monday. Although the lake is still partially covered, the ice is getting soft and soon will begin breaking up. Eagle Nest Lake State Park remains open and fishing will be allowed from the shore in areas with open water. Anglers are advised to contact the state park for current fishing and ice conditions at (575) 377-1594. For information about fishing in northeastern New Mexico, please contact the Department of Game and Fish in Raton at (505) 445-2311. SANDIA PARK -- The Department of Game and Fish will host a bear awareness meeting from 6 to 9 p.m. Friday, March 25, at the Vista Grande Community Center, 15 La Madera Road, in Sandia Park. The meeting is open to area residents and others interested in learning more about bears. Meeting topics include relocating bears, public obligations under law, and how neighborhood associations and homeowners can help preserve the bear population. For more information about the meeting, please call (505) 222-4707. 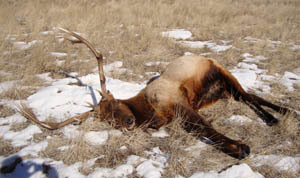 CUBA – The Department of Game and Fish is looking for information about two bull elk that were shot and most of the meat left to rot near Regina at about 4:30 a.m. Feb. 6. A witness reported seeing a late-model Chevy pickup of unknown color leaving the area of Alber Valley Road, just off N.M. 96, after shots were heard. “One of the elk was left to rot and the other one was dragged approximately three miles down Highway 96, where the head was cut off and the left hind quarter was removed,” Conservation Officer Desi Ortiz said. Anyone with information about the incident is encouraged to call Operation Game Thief at (800) 432-4263. Individuals with information that leads to the arrest or charges filed can remain anonymous and may be eligible for a $750 reward.